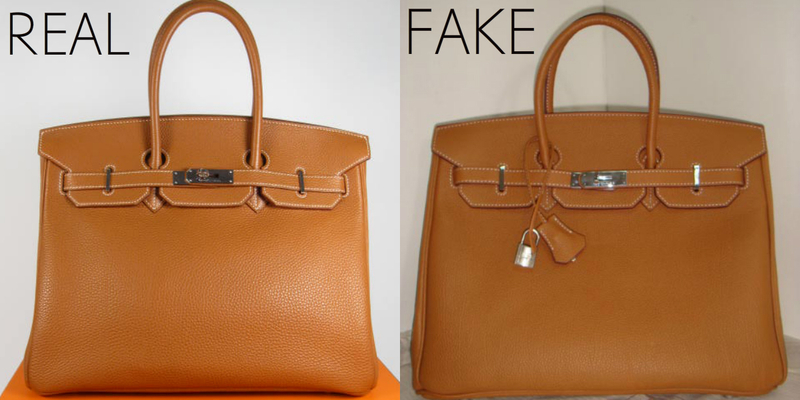 In this article, our team has grouped different pictures from Authentic Hermès Birkin and also fake Hermès Birkin. This guide will help you if you are planning to buy a Birkin bag by other than an authorized Hermès shop. But let us explain with a few words what this bag is. The Birkin bag features a simplistic understanding of intensified iconicity in the high-end fashion industry. Its iconic look and shape, the leather that it’s made with and the amount of time and skill needed to craft and produce one, all together create a luxurious item that millions would love to get their hands on. The Birkin bag by Hermes is handmade in leather and named after the actress and singer Jane Birkin. The bag, ever since its release on 1984 has always been in fashion by being distinguished as a symbol of wealth due to its high price and popular use by celebrities. Now we have shared below 5 easy steps into how you can spot a fake from an authentic Birkin. As you may notice very clearly the logo in the left is absolutely fake compared to the original on the right side. Also, there is a big difference in the color they are printed, the fake dust bag has a red color while the real one has a grey color. This is the first step you need to check when you are buying a Birkin. In the real Blind stamp, you can see that the letter will be in a square or a circle with a letter into it which shows the year of productions. In the fake stamp, you can barely see the ID and Letter. Later we will make an article related to the squares and circles with letters the ID which shows which was the artisan that worked on this bag and their years. A real Birkin is handmade by an artisan and the logo should appear clean and in a regular direction. The logo is “Hermès Paris Made in France”. While in the fake Birking you can see that logo is almost transparent and you can barely see it. You can see that the original Birkin stays tall without any deformation on its sides. While the fake Birkin is distorted on the sides and the leather doesn’t have good quality. The real Birkin as you can see has a clear and fantastic work of art on the leather that’s why it costs so much to buy one of it. When you see the fake picture you understand what kind of material it is made and it makes you understand that you should never buy a fake product.